The US market may be in the middle of its annual Spring/Summer drought of ereader launches, but Europe is luckier. 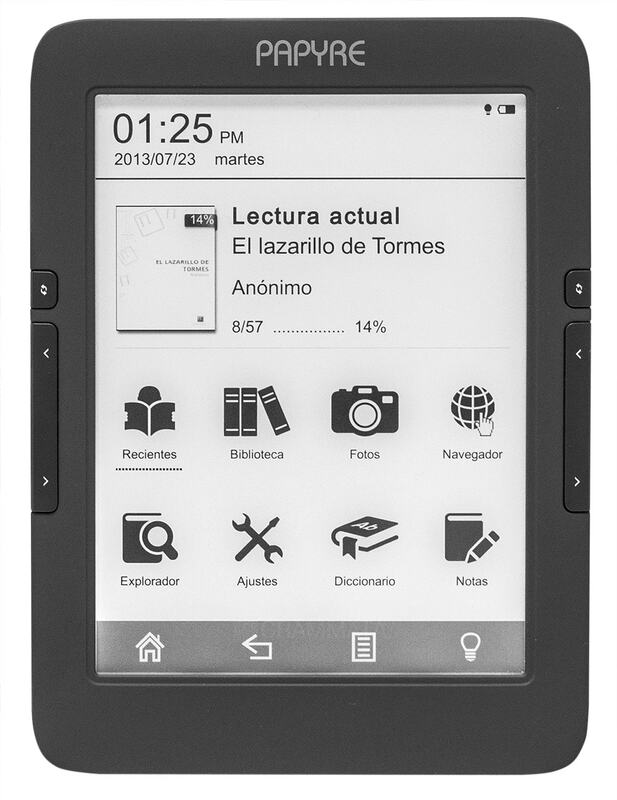 A new ebook reader shipped in Spain earlier this month, and it is currently thrilling reviewers there. The Papyre 630 ebook reader is available on Amazon.es and Rakuten.es, with a retail of 117 euros. This device is equipped with a 6"Pearl HD E-ink screen with a resolution of 1024 x 758, a touchscreen, and a frontlight. It's running Linux on a 600 MHz RockChip RK2818 CPU with 4GB Flash storage, a microSD card slot, and Wifi. Weighing in at 210 grams, the Papyre 630 measures 17cm by 11cm by 9.5cm. The Papyre 630 supports a broad selection of ebook formats, including Epub, FB2, PDF, and more. I don't see a mention of audio support or support for office docs. It looks to me like this device was developed by a certain Chinese company. It's being sold in Spain by Grammata, a local ebook retailer which also sells ebook readers and tablets in 4 countries (according to the website: Spain, Mexico, Argentina, and Columbia). Grammata boasts 50,000 titles in their ebookstore, putting them far behind Nook, Kindle, and Baja Libros. Front-light and page-turn buttons and unavailable in the USA! I wonder if it’s rootable Android. The description said Linux, so probably not.